Every Disney princess has wishes, but Jasmine wants one thing so bad. Find the Aladdin's lamp and ask Genie to help you with your wish. What would that wish be? 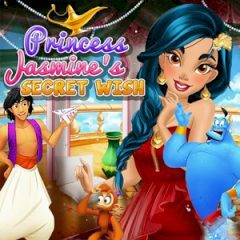 Princess Jasmine has a secret wish nobody else knows about. She dreams about Aladdin and her live together, but he doesn't pay much attention to her. Well, maybe that's because Jasmine is not a typical princess. She wears modern outfits and tries to look fashionable. First, you need to be sure about it, so find the lamp and ask the Ginny a few questions.